Although altered over the centuries, the Church has, inside, some unique architectural features. The fragmentary historical records that survived to this day do not allow us to draw a complete picture, but they are enough to arouse interest in the Parish that is unlike any plebeian churches present in Valdarno. The façade is characterized by two short convergent stairways leading to the front door, raised above the roadway. 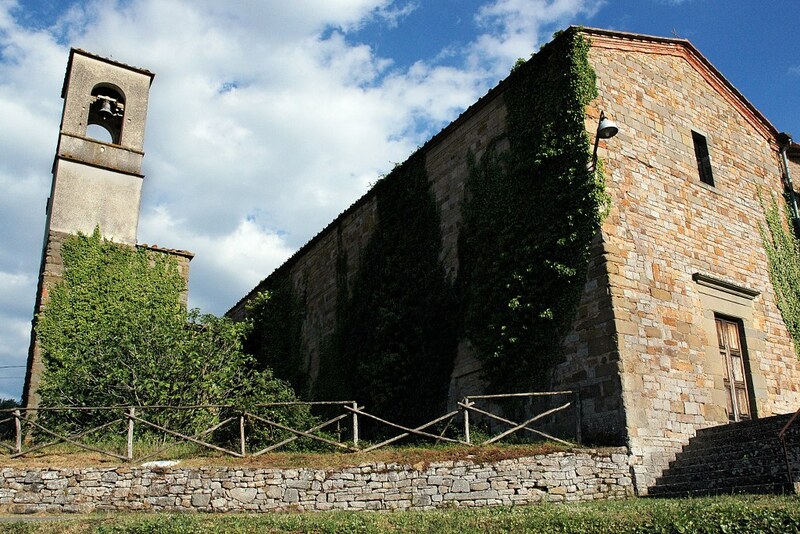 The Parish Church of San Pancrazio is the only example of a rural church with a raised presbytery, set on the coverage of a crypt. This is divided into three small naves by columns topped by capitals, on which rests the vaults of the roof of this crypt. There was a very old monolithic baptismal font, but it was not the original one as it comes from the abbey of Vallombrosa Montescalari, located in the town of Greve in Chianti, and now returned to their rightful owners. On the lintel of the door that leads into the crypt cells of the bell tower is still visible an inscription with date: year 1147. At the sanctuary is accessed via a stone staircase against the wall right of the nave. In the apse are the remains of a fresco depicting the Madonna and Child with Saints Lorenzo and probably Pancrazio recognizable in the role of young Roman. The presence of the crypt has led some scholars to speculate that the place of worship may have been founded by a monastic community and then became parish church, but perhaps the story of this place of worship is a bit more complex. It’s likely that in Roman times the height where find the parish church and the small village was inhabited, as well as would suggest the finding, along the ravine of San Pancrazio, of fragments of pottery and ceramics related to the remains of a small cemetery. The structure of the church is traceable back to the XI century, but the simple architectural elements found in the crypt would think of an existing place of worship dating from the eighth century. On the other hand, the date of 1147 carved on a lintel can not refer to the date of foundation as the Church of San Pancrazio is often cited in papers of Badia a Coltibuono in the eleventh century. These citations are not always unique because sometimes on speaks of San Pancrazio in "Avanano site" and "in situ Caprilia" other in "site Vietini". In 1299 employees of the Parish were the following churches: San Salvatore in Vacchereccia, San Michele al Colle, San Pietro a Massa, San Donato di Castelnuovo e Sant'Andrea di Montetermino. The origins of the Church of San Pancrazio not yet been fully clarified. Among the cases there is a very original made by the scholar Alberto Fatucchi about the possible founding of the church by the Aryan peoples, probably Lombard settlers. Indeed, as lacking evidence, there are clues that should give pause. The capitals of the crypt would think of an original plan of the early medieval period, consistent with the Lombard presence in Italy. The presence of settlements of people of Germanic origin is documented in various parts of the Valdarno. Maybe not enough evidence to prove a source "Aryan" of the church, but at least lead to reflection and to undertake further research.